All right, you Sherlock fans are getting way out of control. Currently available for purchase: leggings and a matching t-shirt completely covered in photographs of Oscar-nominated otter-human hybrid and greatest living pengwing expert Benedict Cumberbatch. 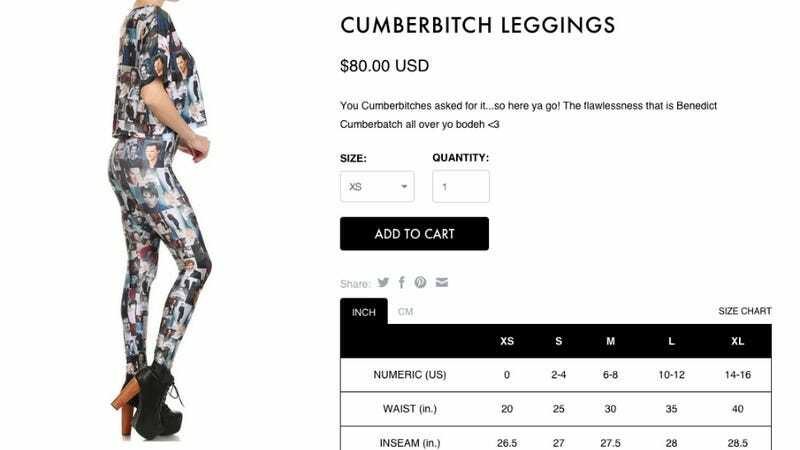 The Hollywood Reporter (h/t the Week) reports that Poprageous has debuted a "Cumberbitch" t-shirt and leggings, both of which are stretchy and composed of pics of Cumberbatch. Casual shots, black-and-white fashion shots, Cumberbatch as Khan, even a drenched Cumberbatch emerging from a lake doing his best Darcy impression. The Cumerbatches are all here! The complete outfit is a steal at $125. You're responsible for finding your own matching loafers embroidered with Cumberbatch's face. Might I suggest Etsy?